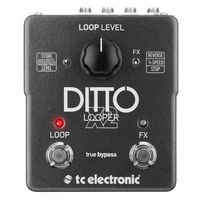 Ditto X2, Looper from TC Electronic. A Ditto in the hand is worth X2 in the bush? Following up on the success of the original Ditto, which had only two controls, TC strikes again with the X2, featuring more than twice that. Can it give the final blow to its competitors in the not-too-expensive loopers market? Right out of the box, TC makes itself felt: the metallic casing with big footswitches inspires confidence. In terms of dimensions, the young Ditto had to become bigger to fulfill its functions, just like Robert de Niro when he put on his Jake LaMotta clothes. The X2's measurements are 5.3" x 4.4" x 2.1", guaranteeing an easy footwork in the ring. There is a Loop button to play back and record the loop and the overdubs, plus a second button of the same size named "FX," which allows you to enable the built-in effects. The latter is controlled with the help of a small three-way switch for selecting one of the effects: Reverse (which, as its name implies, reverses the loop), 1/2 Speed (to halve the speed and lower the pitch one octave) or Stop. 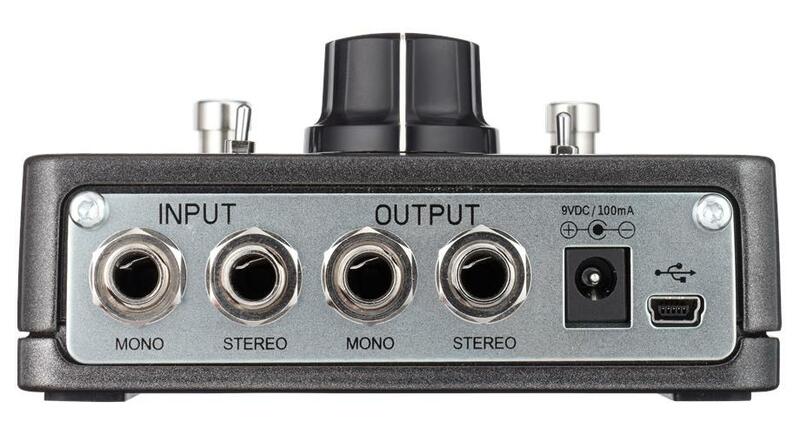 On the other side of the big central knob, which controls the loop volume, there is another button that looks very similar to the effects selector: its role is to save/erase the loop in the "transferable" memory, but also to control the volume of a loop previously loaded from a computer. And, finally, on the back of the pedal is a compartment for two 9V batteries. 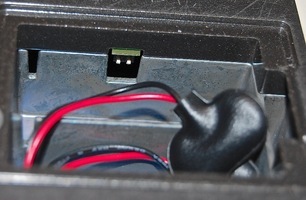 Very good news for those of you who don't like PSU cables lying around in the ring, especially as TC even thought of the icing on the cake: the pedal can also work with one single battery, though with a reduced operating life. 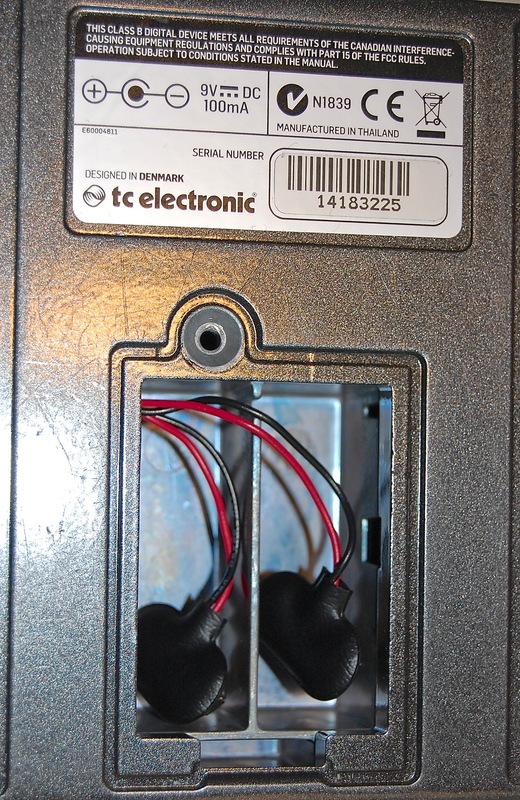 The manufacturer also thought about those who just like to overdub straight away, without play back in between, by including a tiny dip switch hidden in the battery compartment that allows you to modify the order of the instructions given by the loop button accordingly. Once connected to the amp, the Ditto X2 reveals itself easier to use than its eldest, for those who just want to loop. It's unbelievable how a dedicated button to stop the loop can change your life live, for example, when you need to stop the loop at a very precise moment or to readjust it if the drummer gets tangled up with the drumsticks. As for the effects, they are of a very good quality. Everything is a matter of taste, of course, but other types of effects (or, even better, a second independent loop) would've been much more appreciated. Nevertheless, the two included effects provide four possibilities. I'll explain myself: when you record a loop with "1/2 Speed" active, you will listen to it at twice the speed when you disable the effect. In other words, the effects loop affects all overdubs at the same time, but the effect on every overdub will be different depending on whether you recorded it with or without effect. It's also important to point out that you can disable the effects without the need of the tiny selector, by double-clicking on the FX button, and that there are red/green LEDs to let you know which effect is active (or not) at a glance. When connected to a computer, the X2 is immediately recognized as an external drive, so transfers are child's play. You can also import WAV, AIFF and even MP3 files (with a longer transfer time due to the internal encoding) to play along. TC even offers free downloadable jam tracks (which weren't available at the time of the review). In use, the only real issue has to do with the saving of the loops: effects are applied to all loops and not only to those you chose during playback. This means you won't be able to save a loop incorporating one or several effects in an intelligible manner. It's not a tragedy, because most of us will only use the effects sparingly, but it nevertheless remains a bit exasperating given the quality of the sound that is stored. 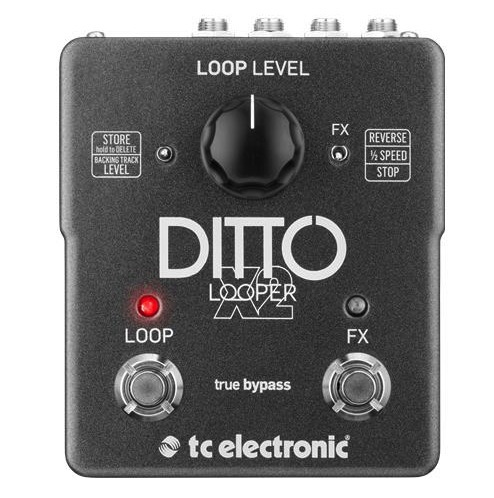 I would've preferred a second independent loop instead of the included effects, but let's not quibble, the X2 is an excellent looper pedal that is easier to handle on stage than its older sibling, thanks to a second button that stops the loop with a simple foot stomp. Its only real drawback is the saving of loops with effects (which, by the way, won't make any headlines). 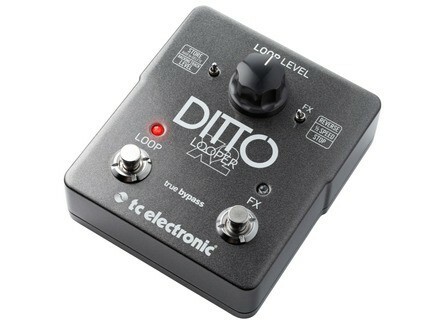 With a suggested retail price of $180, TC only tickles Boss, Digitech and others who offer pedals with lots more functions. 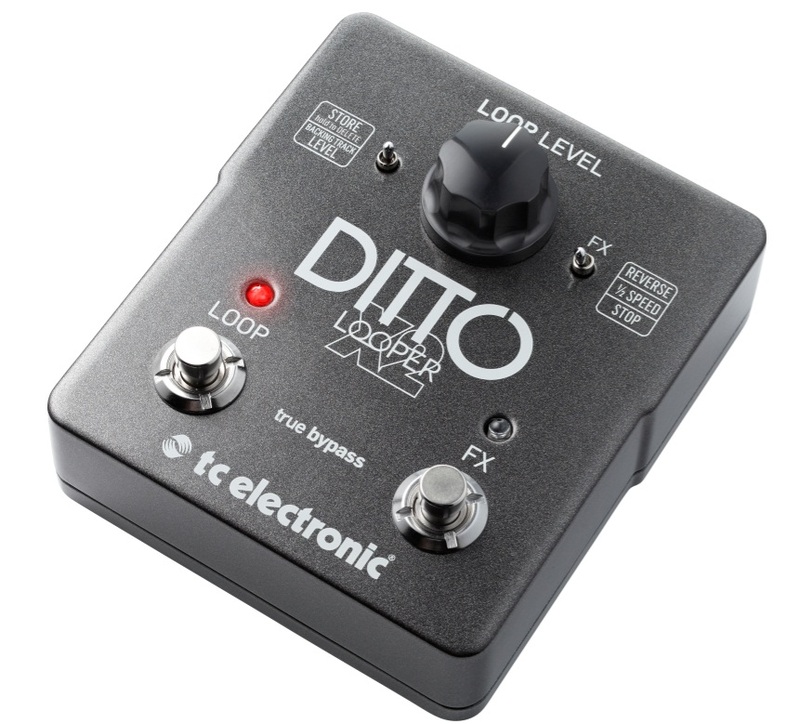 In sum, the Ditto X2 will make the day of those who like to loop on their own or in pairs, with ease and simplicity. Those of you who like to have a broad range of possibilities at your feet will be left wanting for more. I have to send it back!